Two years after the most incredible experience that the city of Milan had ever witnessed, and personally the best professional time of my life, I was asked to present some insights about the communication of the European Union pavilion at Expo Milano 2015. Exactly in a time where “communicating Europe successfully” seems a make or break topic to decide the future of the Union, I was happy to take a step back and think about what was great, and what could be improved about our efforts at this world stage event which welcomed over 21 million visitors in 184 days. This content is drawn from the evaluation report that the European union task force produced (by an independent contractor) after the event and it will be presented at an event in Milano about the heritage of Expo in April 2017. I always welcome feedback and thoughts on everything I write, so feel free to contact me! ‘Communication impact’ can be conceptualised as the capacity of a given communication initiative to reach the target group and produce an ‘effect’ on its attitudes, beliefs and/or behaviours. This section examines the extent to which the EU succeeded in reaching the targeted audiences and whether the visitor experience contributed to improving their knowledge and perception of the EU pavilion at Expo 2015 Milano. The EU aimed to use its presence at Expo Milano as an opportunity to communicate with EU (and non-EU) citizens showing them a friendly face of the EU and getting closer to their hearts. This differed from the more ‘formal’ and ‘institutional’ participation of the EU in past Expos and in massive communication activities in general. Therefore, the pavilion’s main attraction (visitor experience) was designed to reach all kinds of visitors, but especially families with children and young people, and involve them in an entertaining and emotional experience that talked about the EU and its food-related policies. The expected result was that people emerged from the visit with a more positive attitude towards the EU and greater awareness of its actions in the food and nutrition realm. Most articles saw the pavilion as part of the EU’s new communication strategy; an attempt to bring a sense of closeness and unity between European institutions and citizens. At the same time, it was described as trying to raise awareness of EU policies. Moreover, the pavilion was described as different from other Expo structures, which tended to focus more on architectural design rather than depth of content. The EU pavilion’s ‘unexpected’ message of hope and cooperation, symbolised by bread and Alex and Sylvia’s story, was seen as a refreshing alternative from the ‘Europe of the bureaucrats’, a much needed reminder of the institution’s original mission and aims. The aim of focusing on families with children and youngsters was grounded in the idea that many of the younger generations take the EU ‘for granted’ and, to some extent, are indifferent towards it. During the preparation phase, it was understood that the Expo offered a unique opportunity to communicate with this type of audiences and show them how the EU is present in their daily lives and what are the values it promotes. This approach was in line with the political guidelines for the Commission 2010-2014, where President Barroso recognised that there was a need to rekindle “a passion for Europe, a new pride and feeling of connection between the EU and its citizens”. This understanding continued under the next Presidency when Jean-Claude Juncker emphasised that trust in the European project was at a historic low and that it was critical to rebuild bridges in Europe to restore European citizens’ confidence. The EU pavilion showed an important capacity to attract ‘spontaneous’ visitors (about two thirds of visitors) i.e. people who had not planned to visit the pavilion in advance, and this was partly due to the promotional actions by volunteers. In effect, according to the survey of visitors, almost 15% of total visitors went to the pavilion because of the work of volunteers, which were deemed by the pavilion as their key on-site ambassadors. The volunteer programme was an important topic of discussion in national and local media. The high number of applications to the programme (which doubled the number of posts available) and the interest among young people received particular attention. In fact, young people in general, and volunteers therein, were described as the true protagonists of the EU participation at Expo. Visitors registered and recall the main messages conveyed in the EU pavilion, in particular those of ‘cooperation’ and ‘working together’. The EU pavilion also generated an interest in the EU and conveyed positive feelings about it, especially among visitors with pre-existing ‘fairly’ positive and ‘neutral’ views of the EU. But the pavilion did not necessarily provide visitors with an increased understanding of EU policies and how it realises the goals/values promoted in the pavilion (cooperation, peace, teamwork, etc.). 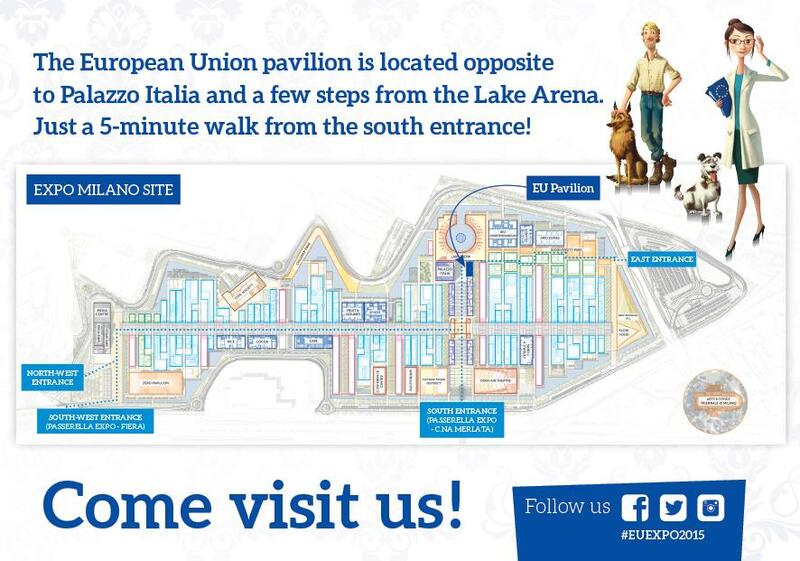 A central element of the EU presence at Expo Milano was the media strategy, which involved the development of the EU pavilion’s online presence (social media and website) and relations with the press. The objective of this was that the EU presence in Milan obtained high level coverage in online and traditional media and therefore reached visitors to the Expo, but also those who could not attend the exhibition. The EU pavilion had, in particular, a strong social media performance that contributed to creating a ‘buzz’ around the EU presence at the Expo, as well as develop a ‘digital food hub’ i.e. a digital community of people interested in following / discussing food policy with the EU. Throughout the duration of the Expo, the communication team was not only capable of developing this community, but also maintained a growing interest towards the EU’s social media activities. On Facebook, the EU’s pavilion profile was not only the most followed one during the whole duration of the Expo (with even more followers than Italy and Germany, which received the award for “Best Pavilion”),but also worked as a platform to communicate on food policy by various EU institutions. The EU pavilion’s Twitter account was very successful too, reaching also the top 10 of best performing pavilions (in May and June 2015 it was the second most followed account, after the Italian pavilion one). On Instagram, the EU pavilion reached foodies and graphics’ enthusiasts and engage them in photo-based calls to action. For the communication team, this was the most successful social media platform, which reached the initial target of 2,000 followers very quickly (end-June 2015) and grew outstandingly till the end of the Expo. Media coverage was especially high prior to the Expo opening on 1 May 2015, but continued to be relatively good during the next six months. The EU pavilion’s preparation phase received extensive press coverage in the Italian printed press, online newspapers and blogs, and in national radio and TV programmes. Repercussions obtained in the press were mostly positive, with articles focusing on the EU’s ‘innovative’ communication strategy, the educational content of the EU pavilion, and the EU’s attempt to increase dialogue with citizens. The scientific/policy events and the volunteer programmes also received satisfactory levels of media coverage. It was great to be invited at Radio Alma to discuss about Expo Milan 2015 and the participation of the European Union at the world’s biggest event on food and nutrition and the biggest event of 2015. Expo Milano 2015 will be the first World Expo to take place in Europe in 15 years and its theme, ‘Feeding the Planet, Energy for Life’, is of vital importance for Europe and the world. As a global player in the debate on food and sustainability, the European Union (EU) should seek to reinforce its position, highlight its achievements and, most importantly, take this opportunity to work towards finding common solutions to these issues with other international organisations, countries and private stakeholders. The EU leads the way in terms of promoting quality food and ensuring food security and safety and environmental sustainability. Indeed, with over 800 million people facing hunger in less economically developed countries and high and increasing levels of obesity and non-communicable diseases in developed countries, now is the moment to act. Ill-informed food choices, dwindling natural resources, climate change and threats to the world’s biodiversity are all issues that need to be tackled urgently. Expo Milano 2015 will focus the World’s attention on addressing these challenges and provide a platform to deliberate on these pressing issues. The timing of the Expo, which coincides with the target year of the United Nation’s Millennium Development Goals (MDG) and the launch of the Sustainable Development Goals, makes it crucial that the EU contributes in a substantive way to these negotiations. It will represent an important milestone for the global debate on food and sustainability. In this spirit, 2015 will also be the European Year of Development. This year provides an opportunity to engage with EU citizens and showcase the EU strong commitment to eradicating poverty worldwide and to show how every euro of support helps to make a difference in the lives of so many, in some of the world’s poorest countries. 2015 will also be the midpoint of the implementation of the EU’s Europe 2020 strategy for growth and jobs. In a changing world, we want the EU to become a smart, sustainable and inclusive economy: an economy which delivers high levels of employment, productivity and social cohesion. We intend to seize the opportunity of Expo 2015 to further promote understanding of EU policies and increase cooperation with our partners both in Europe and around the world, especially in the area of research and innovation. “I’m jealous of you.” That’s how I started my social media training to the ten ambassadors from the Erasmus Student Network in Italy (ESN) who have been awarded the chance to tour Europe and present the opportunity to volunteer at the EU pavilion at Expo 2015 in Milan. Indeed, since I was an Erasmus student myself (not so long ago) and had the great opportunity to study European integration at the University of Antwerp, I am very envious of these young men and women who will travel Europe on behalf of the EU and Expo 2015. Young people are going to be the protagonists of the activities of the EU pavilion, thanks to the collaboration between the European Union and ESN. Social media will help these ambassadors reach wider audiences during their trip and share their experiences with a very personal touch. The general aim of the “Students 4 Expo S4E” project is, on the one hand, to promote EXPO and, on the other hand, to underline the role of the European Union during the international event which is going to take place in Milan in 2015. Ten students will play the role of “European EXPO Ambassadors” for the whole semester preceding EXPO. 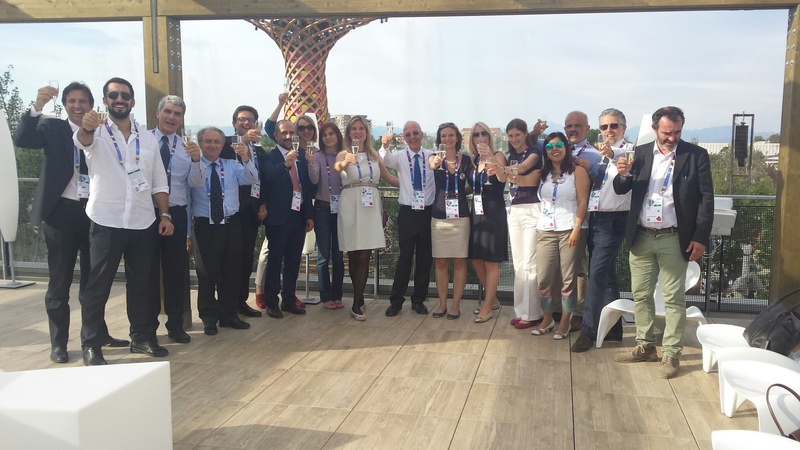 The pavilion of the European Union intends to offer all young Europeans the opportunity to actively participate in a historic event, Expo Milano 2015, contributing to its activities and creating a unique learning and communication experience. The EU at Expo is looking for over 900 young persons who have a passion for Europe that they would like to share with visitors to the EU Pavilion in their capacity as volunteers. More info on the call for volunteers. The specific aim of the project is to increase awareness, in an European academic environment, of the role of the European Union inside EXPO and of the scientific topics at the core of their pavilion. Erasmus Student Network Italia will be responsible for this project and will help the European Union reach students who are not well informed yet about EXPO themes. Follow #Students4Expo for more info on Twitter. Expo Milano 2015 is a Universal Exposition with some very unique and innovative features. Not only is it an exhibition but also a process, one of active participation among a large number of players around the theme of Feeding the Planet, Energy for Life. It is sustainable, technological, thematic and focused on its visitors. Open from May 1 to October 31, 2015, the Expo will host over 130 participants. Running for 184 days, this giant exhibition site, covering one million square meters, is expected to welcome over 20 million visitors. Expo 2015 represents a huge opportunity for Italy and for Europe to present their projects, innovation and policies to contribute to the global debate on how to feed 9 billion people by 2050. 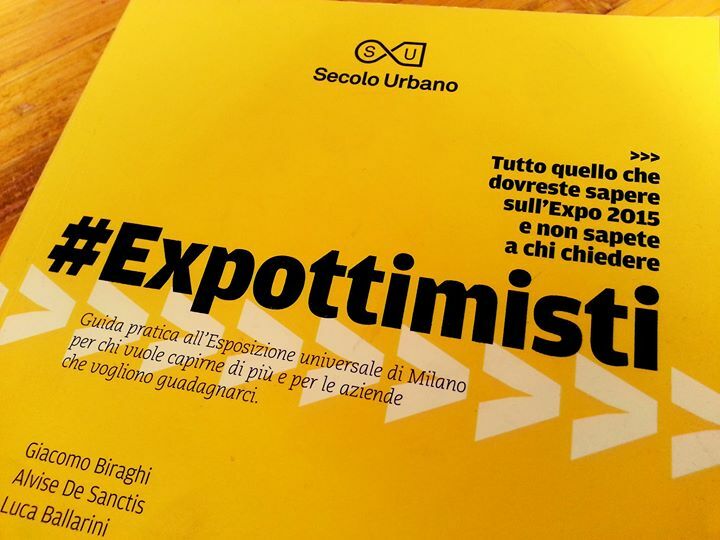 #Expottimisti is a guide book with all you need to know about Expo 2015 whether you are an individual, an association, a charitable organization or a company. It is a visually experimenting product intended to engage with the wide target audience of Expo and propose something new to the public.